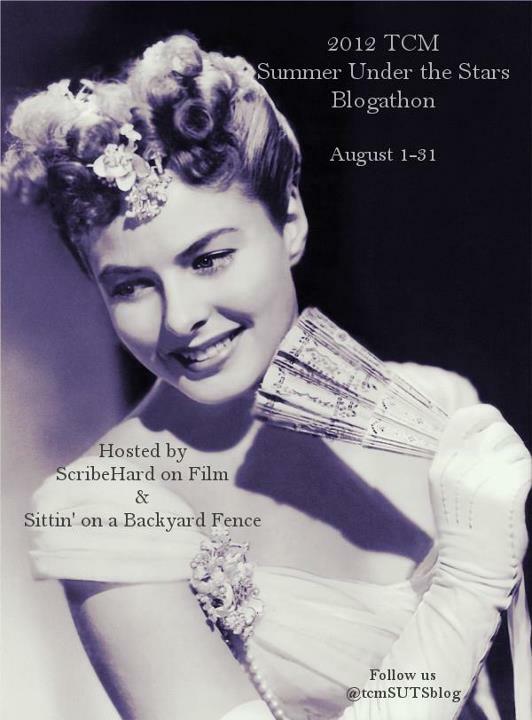 This post is a part of the Turner Classic Movies’ Summer Under the Stars 2012 blogathon, as hosted by Michael of ScribeHardOnFilm and Jill of Sittin’ On A Backyard Fence. Thanks for the opportunity to share my admiration for Ingrid Bergman, who’s being celebrated August 29, a bittersweet date that marks her day of birth in 1915 and the day we lost her in 1982. 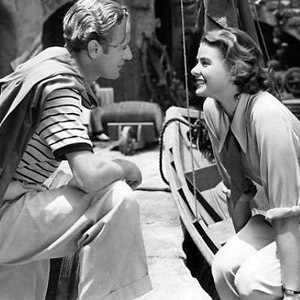 It’s only fitting that one of my favorite actresses would be Ingrid Bergman. After all, she’s my mom’s namesake. Long before we had TCM and videotapes at home, we relied on network television as well as our local stations to give us the experience of old movies. Thanks to my mom, I cherished them then as I do now. 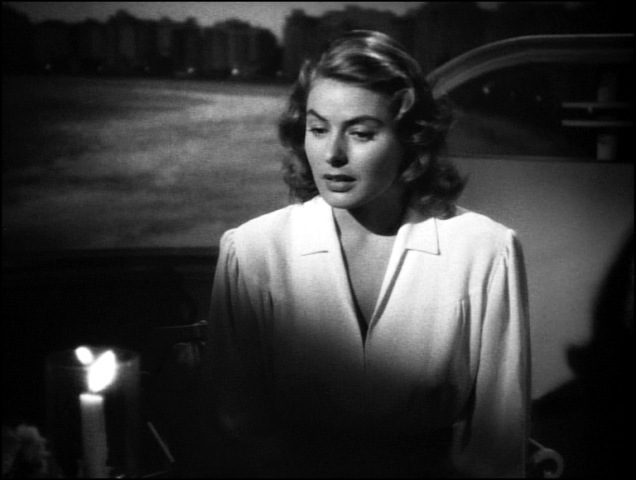 When I was about ten, I watched Miss Bergman in her iconic Casablanca (1942) role for the first time – with my mom. I’ll admit, I didn’t fully get the gist of it then. But, what I do remember was Miss Bergman’s face in that film. 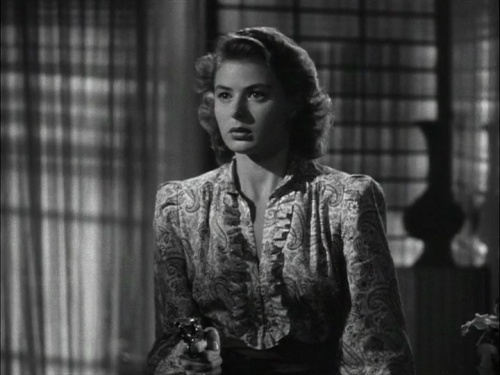 Her subtle responses really struck me as they conveyed what was really going on with her character, Ilsa, with such poise and depth; especially in the scene when Ilsa threatened Rick for the letters. It was a transformation that I didn’t immediately see coming. Her facial expressions from love to desperation and back to love confused me and moved me. Those looks were much louder than her words. My guess is, that was the plan. Many years later, when I saw Casablanca again, I grasped the magnitude of the story. However, I found myself really paying close attention to her face again. She’d really captivated me and left me in awe at the roll of the credits. She proved to be one of the great actresses possessing such a natural tenor to morph her characters into reality and allow the movie to flow evenly in her presence. As I later realized after watching many of her other films over the years, Miss Bergman didn’t merely act. She was that persona on screen and for the duration of those moments she shared, there was a relationship with her, her co-stars, and the audience. Several of her films resonated intense emotion through her characters in times of sorrow, sympathy, desperation, joy, and love. She didn’t have to tell us; she showed us… all in a look or even the twitch of a muscle in her face, a gleam in her eye, and we knew where she was. Intermezzo: A Love Story (1939): (as “Anita Hoffman”) In this film, the moment that grabbed me was the reality that struck her face at the end of her relationship with Holger (Leslie Howard), when he said goodbye in the pub. We watch it hit. When she left soon after, as they stood at the window of the store – I have to give it to him – he presented the same level of sadness that tugged my heart. The Bells of St. Mary’s (1945): (as “Sister Benedict”) The moment when Father O’Malley (Bing Crosby) tells her he’s sending her away made me ache for her. She was moved from moments of elation to a quick, though gradual descent into sadness and uncertainty; the feelings slid across her face. It was heartwrenching. Notorious (1946): (as “Alicia Huberman”) I have to contain myself as I try to pick one illustrating scene from this film. There are so many! It’s my favorite classic film of all! Where she doesn’t speak, she doesn’t have to. Again, her eyes, nose, mouth gestures do enough, especially at the race track. At first she’s happy to see Devlin (Cary Grant), then in no time, we’re in the midst of a lover’s quarrel. It’s a quiet one, only to be heard between the two of them. “Oh Dev, Dev. Why don’t you believe me? Just a little,” she says as a tear trickles down her check. 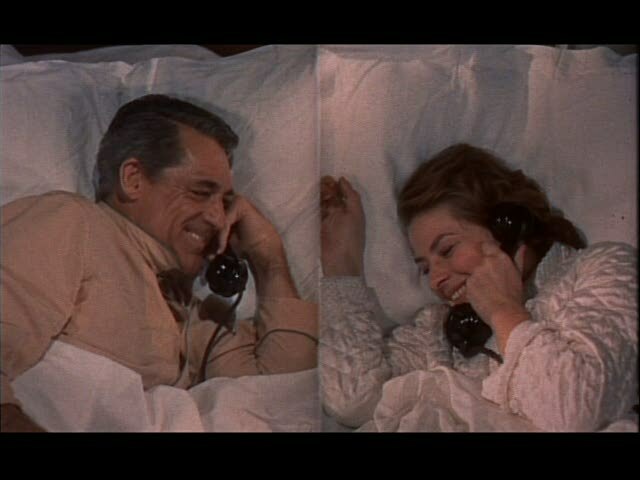 Devlin (Cary Grant) in the coldest manner eventually tells her, “Dry your eyes, baby, it’s out of character.” In these short minutes, vivacity is pulled from her face as it’s covered with binoculars. We see the firm line of her lips under those binoculars (and that teardrop) and the sudden (and albeit, quite comical) look of annoyance to drape her face when her fiancé Alex (Claude Rains) approaches them. And then there’s that frightful incident when she realizes something more than coffee is in her cup. Again – no words, pure facial reaction and we want her to be rescued… now. And then there’s the quiet pride in her face when she gets the “little bird call from her dream man” when she sees Devlin again. And… and… see I can’t stop. Anastasia (1956): (as “Anna Anderson”, “Anna Korov”, “Anastasia”) After several years of being socially and professionally blacklisted in the U.S. for her extramartital affair to Roberto Rossellini and their subsequent marriage, Miss Bergman returned to give her second Oscar-winning performance. It was indeed strong one. She showed such incredible range from a confused, homeless woman, who’d run away from an asylum, to one of regality and worthy of respect. She convinced us all, as she revealed she had no need to convince herself. That was the heart of the entire story and she gave it; some say it was like a reflection of the scope she’d spent out of Hollywood’s graces to a triumphant return. As usual in this film, her face said a great deal, especially when she emphasized to General Bounine (Yul Brynner) just how badly she wanted to know her own identity. Her scenes with the Empress (Helen Hayes) were the most poignant. Indisceet (1958): (as “Anna Kalman”) This was her second film with Cary Grant and there really seemed to be just a lot of merriment on that set. It’s a fun movie to watch (when I’m not gawking at the décor, especially on the walls, of her flat). There’s one fantastic scene in the beginning of the film, which speaks volumes and of course sets the tone to come. 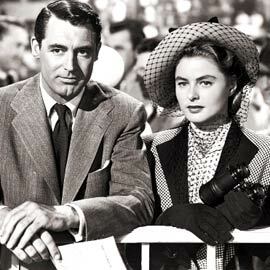 When she looks at Philip Adams (Grant) for the first time as he arrives at her front door – he’s impeccably dressed, unannounced and completely unexpected – she looks at him, in silence, the way perhaps many of us would look at Cary Grant if he stood at our front door. Smitten, she’s like a schoolgirl who even forgets she’s got cold cream on her face as she stares. She’s so utterly down-to-earth; he too is smitten. 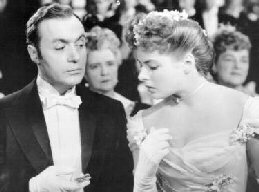 The only time Miss Bergman seemed to act in this movie was when she played her character’s role as an actress in the midst of a performance. There are so many more of her roles I could name, but I’ll encourage you to seek these movies out as well as her others. Pay attention to her face, too. She was a breath of fresh air on the screen in all of her roles. She presented such charisma, and even a touch of shyness in her characters, with sincerity and unpretentiousness. My grandmother obviously noticed the amazing quality of Ingrid Bergman to honor her daughter with her name. My mom, naturally a lifelong fan, thinks so too. Yes, she was indeed! Thank you so much for your comment and for visiting!